IE (Internet Explorer) web browser introduced in IE9 a “your most popular sites” feature on New Tab page to enhance usefulness of otherwise blank new tab page. When opening a new tab page, a total of 10 most frequently visited websites are displayed on the tile-based page, where the the most viewed web page is displayed for each site. Users can click on the link on the New Tab page to go directly to the website, without having to click from Favorites. 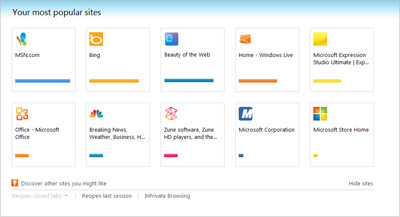 While the “Your most popular sites” on IE9 New Tab page is undoubtedly very convenient, some IE users have been concerned with the privacy issue, as anybody who uses the computer will be able to openly see the list of websites visited, in fact, most visited by user(s) of the computer. 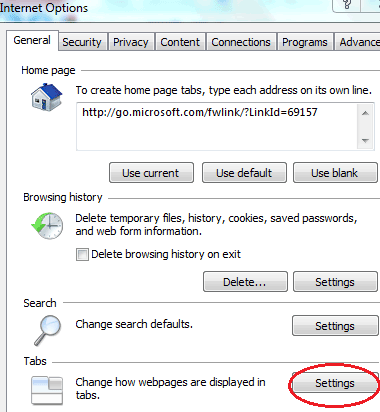 It’s possible to disable the IE9 New Tab’s Popular Sites feature. When turned off, IE will remove and hide the “Your most popular sites” when a new tab is opened, replacing it with either a blank page or your home page. In IE, go to Tools (click on Gear icon or press Alt to reveal menu bar) and select Internet Options. Under Tabs section, click on Settings button. Click OK to save the change and exit from Internet Options dialog box. The New Tab page should be removing and hiding the Most Popular Sites now.